Examine is an engineering analysis software program for underground rock structures. It includes modules for geometric modeling, surface meshing, elastic stress analysis based on the boundary element method, and data visualization/interpretation. Examine is an engineering analysis program for underground excavations in rock. Examine was developed mainly for stress analysis, although its data visualization tools can be applied to a wide range of three-dimensional mining and civil engineering data. For example, Examine has been used to visualize microseismic datasets such as seismic velocity, source parameters, and event density. 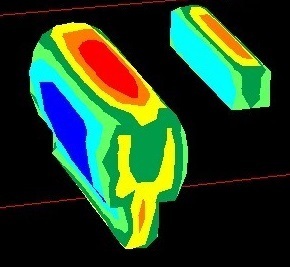 Examine consists of three program modules: Model generates the geometry and boundary element discretization for underground openings, Compute performs the computation of stresses and displacements using the direct boundary element method, and Interpret, with 3D animation capability, visualizes the analysis results. Each of the three modules can be run independently. 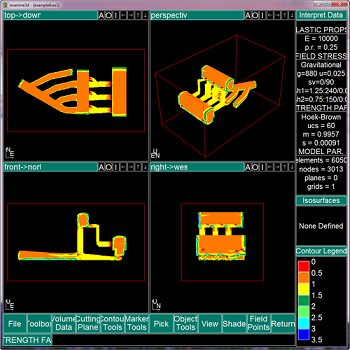 For example, the input data for Compute can be generated using Model or some other CAD based program. Similarly, Interpret accepts data from Compute or from some other source. Both Model and Interpret are fully interactive and menu-driven programs. Examine v4.0 was the first iteration to be a fully-integrated windows application. The compute engine now supports file queues and multitasking. an information bar at the bottom of the screen. The Skin function, which wraps a skin of boundary elements around two or more polylines. Users have the option to specify mesh density and discretization. The Extrude function is used to generate the geometry and boundary mesh for a structure that has a uniform cross-section. The Face function is the most versatile among the mesh generator functions; however, unlike the skin and extrude functions, Face does not generate geometry. It is simply a mesh generator, suitable for discretizing any region bounded by one or more nodelines. AutoCAD DXF Import / Export: Examine can import DXF and export GEO files, allowing users to quickly switch between applications. Examine provides three automatic meshing/remeshing functions: Array Mesh, Radial Mesh, and Automatic Mesh. All three functions require no user input to generate a mesh. Examine allows users to quickly calculate the volume and surface area of an object. Automatic Geometry Validation: The object check function is used to assure that the geometry is valid. The Distance Measuring function is used to both locate a point in your three-dimensional modeling space and to determine a distance to some other user-defined point. Pressure Boundary Condition: The apply traction function allows users to apply pressure or traction boundary conditions to excavations or ground surfaces. Users can specify the region of the pressure, its magnitude and direction. 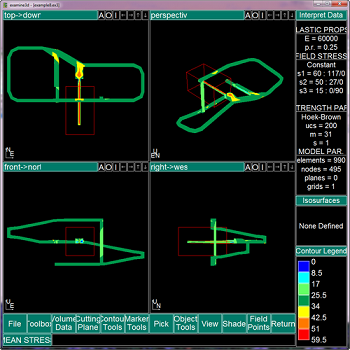 The Geometry Slicer option is used to generate the intersection polyline between the current three-dimensional model and a user supplied cutting plane. Examine is our only software solution based on the boundary element method (BEM). BEM is considered efficient for modeling faulted rock; often more efficient than the finite element method. 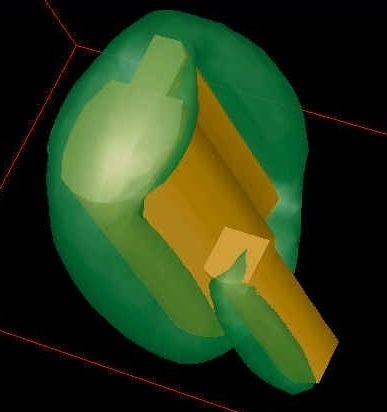 BEM often requires less computational effort by introducing a "mesh" over the modeled surface, rather than the volume discretization required for the finite element method. By analyzing and computing only the surface area of the desired model, as opposed to the full volume, users can save time and effort when using Examine.